Microsoft's .NET framework provides a solid implementation of regular expressions. You can use it in your VB.NET application by importing the System.Text.RegularExpressions namespace. 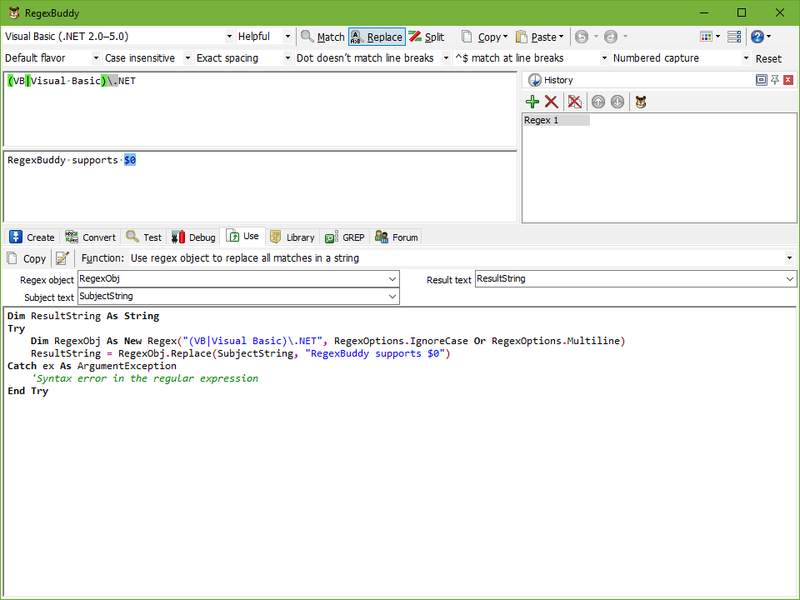 RegexBuddy supports .NET 1.1 through .NET 4.5 as used by Visual Basic 2003 through 2013. While .NET's regex support is solid, Microsoft's regex documentation is very poor. 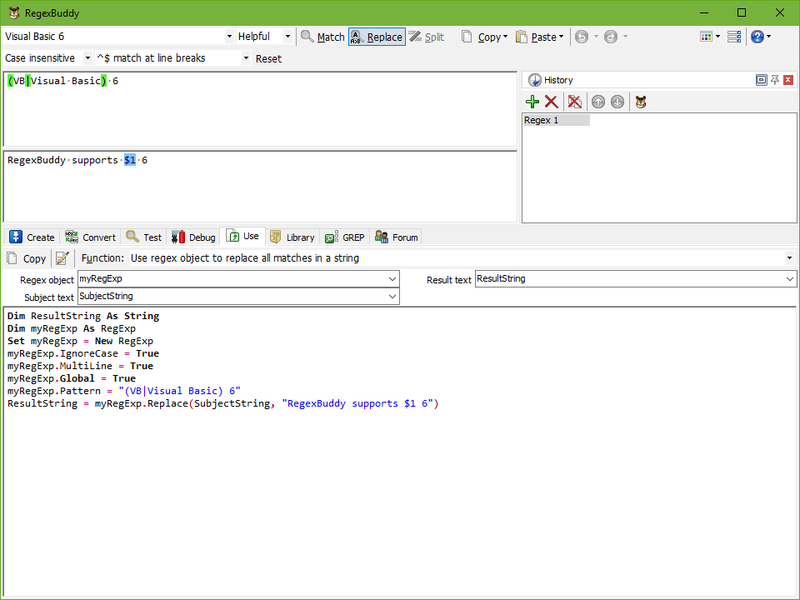 Fortunately, RegexBuddy makes it very easy to use the power of regexes in your Visual Basic source code. If you copied a regex written for another programming language, select the original language, and then convert the regex to the specific version of Visual Basic you're using. 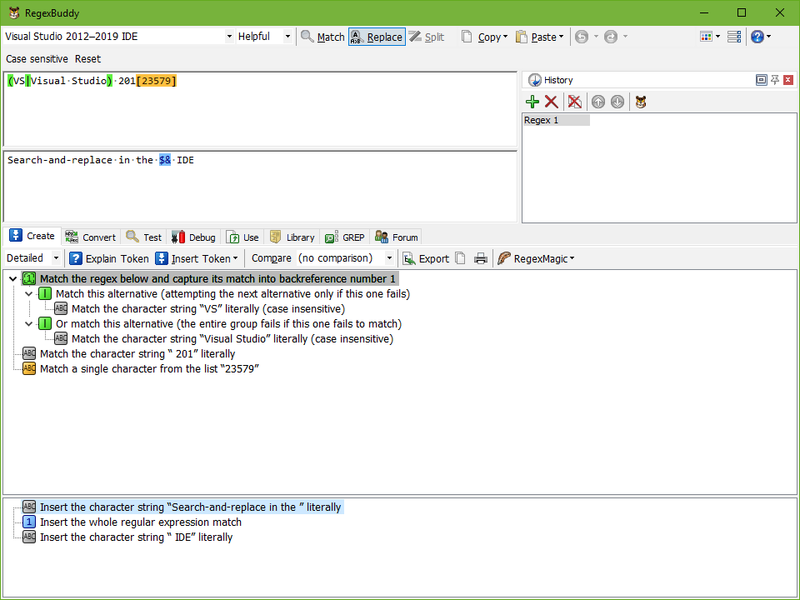 If you created a new regular expression, test and debug it in RegexBuddy before using it in your VB source code. Test each regex in RegexBuddy's safe sandbox without risking precious data. Quickly apply the regex to a wide variety of input and sample data, without having to produce that input through your application. Finally, let RegexBuddy generate a source code snippet that you can copy and paste directly into Visual Studio or whichever IDE or VB code editor you use. Just choose what you want to use the regex for, and a fully functional code snippet is ready. You can change the names of variables and parameters to suit your naming style or the current situation, which RegexBuddy automatically remembers. While the .NET Regex classes and the VBScript RegExp object are quite different, you don't have to remember the details of how to use either of them. Just tell RegexBuddy what you want to do, and you will get the proper VB.NET or VB6 code straight away. Anything can be done: testing a string for a match, extracting search matches, validating input, search-and-replace, splitting a string, etc. Choose whether to create a reusable regex object for best runtime performance, or whether to use a one-line convenience function for maximum source code readability. "RegexBuddy is a great tool! I've always shied away from using regexes because they are so hard to create and test, but with RegexBuddy I've been able to do some things that would have taken hundreds of hours of programming in VB.NET, if I could have done them at all. "RegexBuddy has completely changed my feeling about regexes and has saved me huge amounts of time. I like your price structure, but this tool is worth much more than what I paid for it."